-The purpose of administration is to enable the company to be rescued as a going concern. Through being in administration an insolvent company is protected from its creditors and given time to restructure itself in a way that will allow it to survive. - The company directors might choose to go into administration, or it could be forced on them by creditors or their bank. - The process of going into administration involves the appointment of an insolvency practitioner, often an accountancy firm, to run the business. They have a statutory duty to work on behalf of all the creditors and they will investigate what actions are available to save the business. - At the same time they will do what they can to keep the business operating as normal, although sections that are clearly losing money will be shut down very quickly. They will do what they can to cut operating costs, which is why a round of redundancies often occurs shortly after their appointment. "The scheme is said to have more than £70m in liabilities, though only £6.5m of that is owed to the parent company. The subsidiary holds about £12.6m in “philatelic stock”, said the parent company in a statement issued today. The subsidiary’s “potential liabilities”, said the company, primarily consist of around £54m contingent liabilities relating to the buy-back guarantees, and a further approximate £11m in liabilities included on its balance sheet. 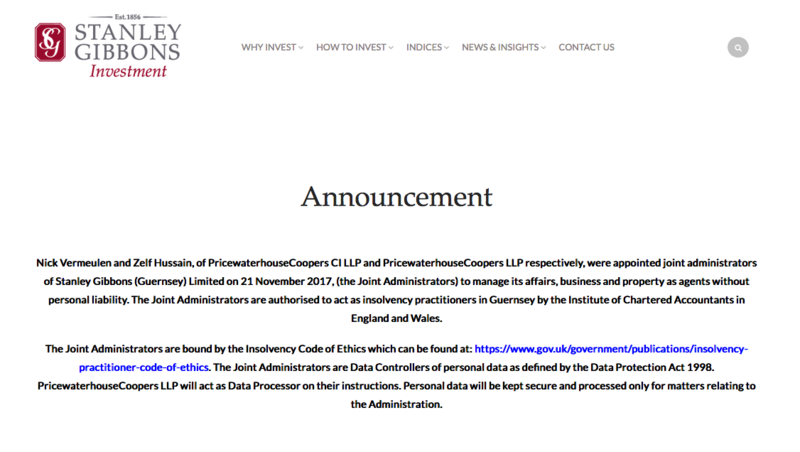 Amazingly the Gibbons Investment page is still available to read on the web, albeit with a new header about the appointment of PWC as administrators, and the investment guide is still available to download! So how is Stanley Gibbons overall? Not so good. Some of us have been following the misfortunes of the company for a few years. These misfortunes have been largely hidden from ordinary collectors, and have involved Gibbons 'diversifying' into new areas and taking on new managers, and - in the view of many - throwing too much money at those ventures. Gibbons became a public company after a launch on the London Stock Exchange in 1968, and was bought in 1979 by dry-lettering company Letraset which was attempting to diversify. The integration failed and weakened Letraset (their chairman was quoted as saying "we significantly overpaid for what we got". - remember these words!). Letraset was bought in turn by Esselte, which soon dumped Gibbons as it was not a logical addition to their business. This led in 1982 to a management buyout by Clive Feigenbaum who owned 50% of the shares and attempted to join the Unlisted Securities Market, but the shares were suspended before trading began following exposures by a newspaper concerning earlier stamp ventures by Feigenbaum. Between 1989-95 all the shares in SG were acquired by Paul Fraser, who sold the company in 1998 to Flying Flowers, but this was not a success and the companies were demerged in 2000, with the value of Fraser's stake falling from £13.5m to £4m. (The chairman of Flying Flowers said the deal "was at the wrong price and at the wrong time" - those words again). Fraser sold his remaining shares in April 2008. After this SG engaged in a vigorous acquisition plan to diversify, a process which included non-philatelic businesses. In September 2010 they bought Benham first day covers (etc) from Flying Brands Ltd (owners of Flying Flowers). The attraction was "synergies between the two databases of collectors... and potential to develop the Benham website". In an attempt to improve its online presence Gibbons acquired US stamp auction/sale site bidStart in November 2012 for US$1 million. BidStart owner Mark Rosenberg was appointed Chief Digital Officer. The online Marketplace was eventually launched in May 2015. In November 2013 SG acquired Noble Investments which included Apex Philatelics, Baldwin's, Drewatts, and Bloomsbury Auctions - a significant diversification. In 2014 the company acquired George VI specialist dealer and publisher Murray Payne, and Mallett Antiques which had premises in London's Mayfair and New York's Madison Avenue. BidforWine was acquired in July 2015. By December 2015 SG had resold Benham to former Managing Director Tony Grodecki and suffered a big write-off of the value in its accounts. In the 15 months to 31 March 2014 SG had trading profits of £6.9m (on sales of £51.8m) compared with £6.3m (on sales of £35.6m) for the 12 months ended 31 December 2012. The big hit of about £1.8m was suffered due to their investment in 'online developments', including the US-owned Bidstart, which seems to have been badly mishandled. Bidstart enabled dealers and collectors alike to - as with eBay - list stamps for sale without regard to condition or accuracy of description, and - because the membership base was mostly in North America - mostly using Scott catalogue numbers instead of Gibbons. SG listed some of their own stock (with SG numbers) alongside and although the stamps were probably superior examples the (mainly US) membership would find them more expensive, if they found them at all, because they were drowned out by cheaper examples using the other catalogue. With the Marketplace launched, Rosenberg and Gibbons parted company in July 2015, and a year later Gibbons sold bidStart back to Rosenberg for "an undisclosed sum" - reported to be much lower than its purchase price. (Sounds familiar.) In October SG reported a hefty pretax loss of £28.9m, from a profit of £1.8m for the previous year. A year later the group posted a loss before tax of £30.2m. A 48% fall in net asset value resulted from a combination of one-off restructuring costs, continued difficult trading conditions and the ongoing legacy of the group's investment contracts, the company said. The other investors in Stanley Gibbons are the shareholders, with directors often holding considerable shares. The value of the shares has been diluted by further shares being issued to raise additional funds, but the price has fallen catastrophically and the company is now ripe for takeover if only anybody had the vision to properly turn it round and concentrate on core areas. When they bought bidStart in 2012 the share price was 288p per share, and it rose to over 300p on the acquisition of Noble Investments. But by September 2015 the price had more than halved to 152p, and following a profits warning in October dropped a further 41p (28%). Shares opened January 2016 at 86p. In February with the share price down to 45p following market analysists' reports, their auditors resigned and by mid-March - when they were looking to raise £13m additional capital - the share price was down below 12p. It rose, but by June was back down to 12p. At this level the price is affected by any sales or purchases, or even by general volatility in the stock market, but a few days ago it was at 4.4p. In March this year the trading results showed a loss of £8.8m (compared with £3.9m) on a turnover of £42.5m. The results reported that the lease on the Strand premises (no, they don't own 399 any more) expires in spring 2018 and the landlord wants the premises back. "A full review of Group E-Commerce strategy led to the closure of The Marketplace, based in the USA, ‎on 7 September 2016 bringing to an end a project which had consumed some £10m cash over the last few years. "The Board believes there remains an opportunity to grow online revenues substantially. This will ultimately be best achieved via a cohesive strategy linking online sales of the Group's own, high quality collectibles assets, with our world renowned publications business. If they can do that without spending too much, they may be successful, but "the Group is currently in default on its bank facilities and the Company remains dependent upon the bank's ongoing support. There can be no guarantee that the bank will provide facilities beyond 31 May 2018 and the Company is likely to require access to further liquidity in the intervening period." As we know, there is strength in the catalogue and publishing business (although the demand for monthly paper magazines will be declining) and it seems likely that this part of the business will continue for many years. Aside from any bought (at deep discounts) by public libraries, many of the catalogues are bought by dealers who require access to the latest information and suggested prices to conduct their own businesses. Collectors tend not to buy catalogues as often, but they need to recognise that the continuation of the business will require continued catalogue sales. Order through your dealer to provide him with some business and a small margin of profit - he may even share the margin and give you a discount from the cover price. An interesting question is what happens now to the investors who put money into the plans with the buyback guarantees. Are these investments now worthless? After all, as I understand it, the investment plans were supposed to be backed by real stamps. Is that correct? If so,wat has happened to these stamps? Are they the property of the investors? If so, will thay be returned to the investors? Or are those stamps the property of Stanley Gibbons (Guernsey)? If they are the property of SGG, that seems to open the rather nasty possibilty that the administrator could sell off the assets of SGG, including these stamps, in order raise funds to pay off the company's debts -- debts which are in part to Stanley Gibbons? Even if nothing as nasty as that is to happen, this whole matter of the way that the investment scheme was sold and managed and the manner of its collapse must surely do great damage to the reputation of Gibbons. I'm surprised that we have not yet seen any comparisons to Afinsa appearing the press, however unfair that might be. Edward Stanley Gibbons would have been mortified! I’m afraid this is all Gibbons fault and “investors” are going to lose out big time. Stamp collecting is first and foremost a hobby. Can you make money from it? Of course if you use your knowledge and a bit of speculation. But to make Stamps an investment is both dangerous and foolhardy. The only Stamps worth “investing” in are the extremely rare and scarce examples as demand for them is always there. But the reason the demand for them is there is because there aren’t many about with some having only have one or two examples known! For Gibbons to start (from the top of my head) saying the £1 Green Seahorse is an investment is ridiculous. A nice difficult stamp and one to tuck away of course, but as an investment? Did Gibbons not learn anything from from the late 70’s, early 80’s where dealers were advertising in Gibbons Stamp Monthly claiming every stamp was investment material? Even my father got partially sucked in when the 10½p Yellow was superseded by the blue version. Adverts plastered all over GSM that the yellow is a future rarity so he bought a half sheet, thankfully the only time he did such a thing as he knew it was rubbish. (I still have it by the way, that really shot up in value eh?!). But ultimately it all went pear shaped and the philatelic market collapsed in the mid 80’s, prices were reset, “investment” became a dirty word and it should have remained so where stamps are concerned. Couldn’t agree more, and many of us have been saying that ever since we started getting the SG Investment emails a few years ago. I am very interested in speaking to anyone who has a claim against Stanley Gibbons (Guernsey) Limited and I may be interested in buying their "buyback " claim. jimjames@insolvencyventures.uk. As to a class action, as an ex lawyer I don't see it really. This is the first indication I have had of this problem. I have, however, been very much aware of the difficulties Stanley Gibbons have had launching, re-launching, maintaining and (most recently) re-launching again their on-line catalogue/personal-stamp-listing program called "My Collection". I have stayed with this despite all evidence I was only adding frustration to a large amount of work. For some reason I will never understand SG decided to move the basic database from the likes of GB Concise to Stamps of the World. In the process huge amounts of my input were turned into garbage, and the whole thing had to be re-entered from scratch (about 2012 if memory serves), and again this year SG re-issued the whole program with additional years, but no amount of begging would persuade SG they were making the same mistake all over again. Once again I am left with a garbled mess, with much data unsorted and unsortable. Many promises on what this reissue would supply were broken, and no thought at all was given to the dilemmas existing customers might be facing. Frankly I doubt there were many existing customers, and even though I was asked (and agreed) to participate in the pilot, the whole thing was forced on us without my input in practical terms. I wonder if anyone else can comment on this Stanley Gibbons failure. The only positive thing I can say is that I have not been charged for my ongoing subscription, and I have been told in an e-mail that I will not be charged going forward until the program is functional. Post and Go News - there isn't any!